I didn’t blog for 4 whole days, and although it was a nice little bloggy break, I was excited to get home yesterday afternoon and throw this post together. And in an effort to always keep you ladies aware of my current favorites, make sure you know that you can always check my “SHOP WITH ME!” tab at the top of the blog! Click HERE! Before we get started….MADAY MADAY! 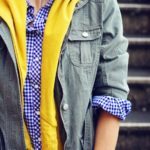 I know I’ve mentioned this before, but my blogger account is giving me fits, and I really need help! I have NO idea why it isn’t updating in google reader. Can somebody help me?!? I would be oh so grateful. THIS JUST IN!!!!! I was checking the Nordstrom site during my lunch, and they added THIS watch! Okay…that watch sold out in a flash. Then I found THIS watch. That one sold out too! and they had added 3 more watches to this sale! THIS one in Rose Gold at 40% off! THIS one in regular gold at 40% off! There is also a mixed metals option HERE, also 40% off! And fair warning, if yesterday is any indication, the reason these watches are being added to the sale is because of their limited quantities. These too will most likely sell out very quickly. Okay, for you people that never broke down and got a denim shirt even though I told you to do so around 23,000 times during the course of the year, your procrastination has now paid off! Well played procrastinators, well played. My favorite choice is HERE and they are basically giving this shirt away right now. I don’t need one (since I already bought 2 this year), but I kinda want to buy it on principal! IT IS UNDER $35! It comes in a medium/dark wash and a light wash. I love both. And even though it’s summer, it’s still a great look with white jeans, colored skinny jeans, white jean shorts, or colored jean shorts. And check out the 112 reviews! It is in juniors, so choose your size accordingly. 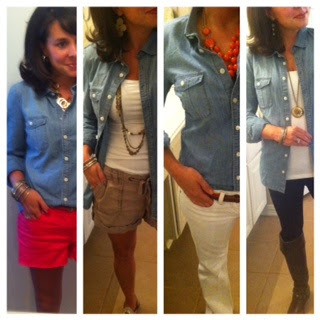 If you need a reminder of some of my denim looks to see how versatile a shirt like this is, see below! The first 3 looks were worn last summer! And if for some reason (a reason which I clearly will never understand) you don’t adore my Callisto wedges (putty wedges HERE, colors on sale HERE), I found some other perfectly acceptable wedge options for you that are on sale. Oh, I’m just kidding. I’ll get over it eventually. I think. THIS wedge is what I’m talking about. The blue and the brown are my favorites, but it also comes in yellow and black. 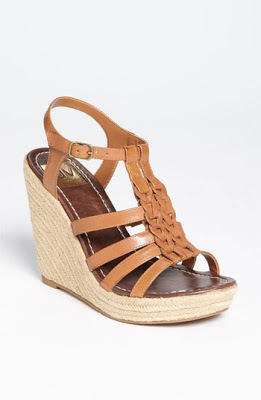 These wedges used to be $110, but they are now 35% off. Click HERE to see all 4 colors. This is a really great shoe. My cousin (well, my husband’s 2nd cousin’s wife…totally the same thing) ordered THESE in cognac while I was with her this weekend. Monica saw them on sale while were doing a little online damage together, and I swear she typed in her size and pressed “order” less than 3 seconds after laying eyes on them. Probably the most comfortable heeled shoes I own! Nothing is pinching, rubbing and squeezing. Toes are not poking through and heel height is great for day activities all the way to a night out. Looking for a nice green wedge? Click HERE. A pink patent (lower heel) wedge HERE. I know many of you were sad that the turquoise patent Callisto wedge was sold out early on. If you were one of those ladies, click HERE for a great turquoise option (and checkout the cool pattern on the platform). If you aren’t in the market for a true wedge, but you want a really cool flip flop…. Coach has some on sale! Click HERE for some colorful wedge flip flops that are 33% off! I could go ON And ON and ON about THE SALE…but the above is all for today. Now we are going to move on to my Pinterest recreation! If you’ve been following Pinterest Told Me To for awhile now, then you know that sometimes I try to copy an outfit EXACTLY how it is in the inspiration picture. Other times I use the picture as simply a jumping off point. This was one of those times. Do I have a cream strapless bustier? No. 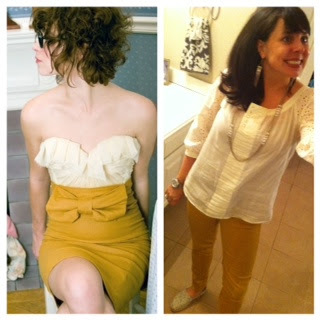 Do I have a mustard skirt with a big bow at the waist? No. But I really liked the color combo, and I had pieces in my closet to recreate the color combo (which is why I pinned this pic in the first place.) It’s kind of monochromatic with a kick! 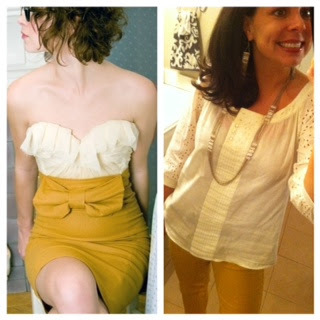 Here is how I made the yellow and cream combo work for me. EYELET is HUGE right now and I totally understand why. I think it is so fresh and classic. I have THIS one from Gap. Mine is the pink, and I adore it. So so cute! I like how THIS one is a t-shirt. You would have to wear a tank under it, so keep that in mind. I like the circle pattern on THIS one. THIS one looks like it is greatness, but it is expensive. Could be worth it?!? 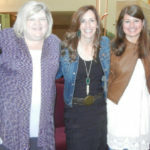 Click HERE for a 3/4 sleeve tunic top from Macy’s. LOVE this one. Click HERE for a sleeveless option (Lucky brand). SO summery and sweet! Another sleeveless peplum option that is loose and flowy HERE. I also wanted to highlight a pair of shoes I found a couple of weeks ago. They would have been perfect for the above outfit (along with just about every other outfit that is in my closet). They remind me so much of my sequined leopard TOMS that I love, but these are much more summery. I tried them on and they are super cute and comfy, and I LOVE the rope like finish on the bottom of them. Click HERE for the shoe. 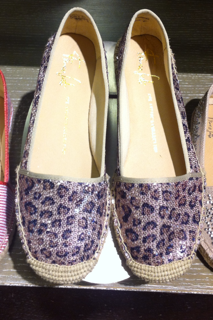 You all know I’ve been looking for a new leopard flat to replace my Target ones from last season, and I think that this might be just the shoe to do it. It’s not really a true “flat” like I was looking for, but I think I might like it even better. That’s all for today….except for about 17 housekeeping issues….there is LOTS to cover after not blogging for 4 days! 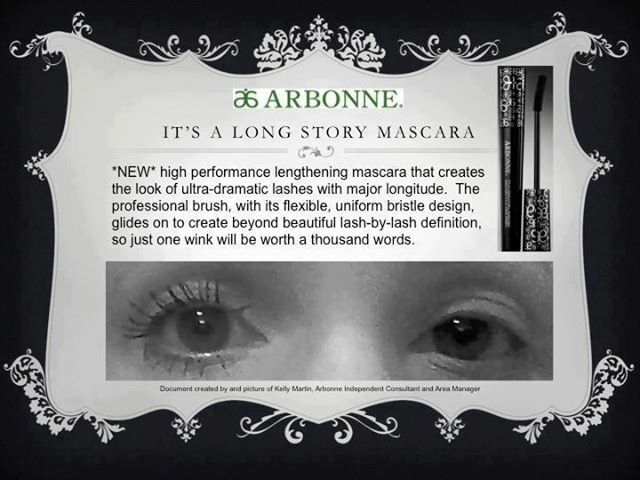 1) Check out the new Arbonne mascara! If you are interested in ordering, contact my sponsor Lola at lola.hurt@att.net I’m thinking this is a MUST TRY! 2) Just in case you are wondering, I AM going to be doing Bachelor Recaps! The next 2 weeks they will be up on Thursday. After that, I am hoping that I will have them go live on Wednesday. Did you guys watch last night? 3) I’m going to have a dedicated Father’s Day post next week…but if you can’t wait until then, click HERE for a nicely organized gift giving guide! It is organized by either category or price point and is very user friendly. If he likes gadgets, there is a flash drive key chain HERE (40% off!) and Bose headphones HERE. Lots and lots of other gifts will be highlighted next week! 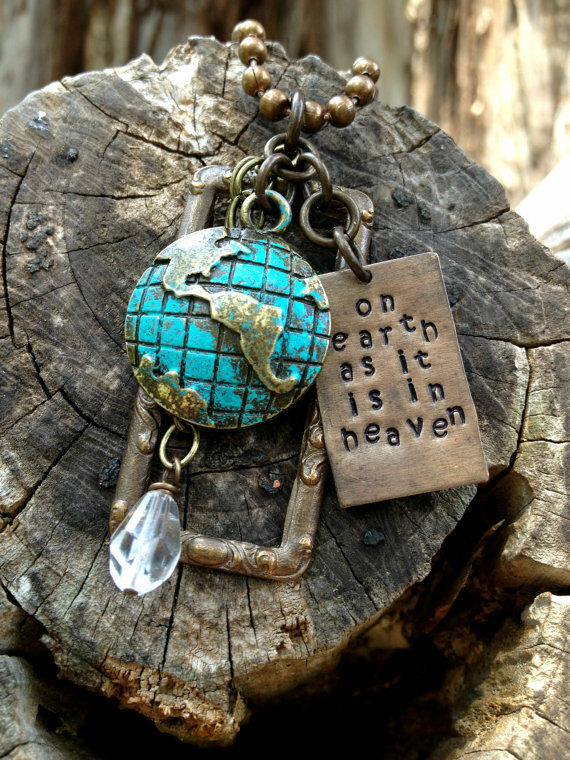 THIS cool necklace was created to benefit the Twietmeyer family as they begin their journey to Guatemala. Profits from the sale of this necklace will help to support their family as they become missionaries serving with Project HOPEFUL and Village of Hope Guatemala. Click HERE if you would like to order one and support a family doing God’s work! 5) OH! ONE MORE THING! I’ve extended the deadline for the Premier Designs necklace because I forgot to mention it on my Friday post before leaving town. 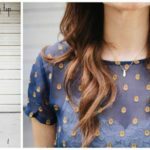 So…click HERE to win this gorgeous necklace and scroll down to the bottom of the post to enter! I watched last night as well! I thought it was great except for creepy Jonathan. Can't wait to hear what you say! I'm so glad you are going to keep recaping The Bachelorette…..poor Des…I thought she had quite a few stinkers last night….of course, none as bad as Jonathon…what the heck???? ?…can't wait for your take!!!! I like the mustard and mayo combo! I've never mixed those two colors before. 1. 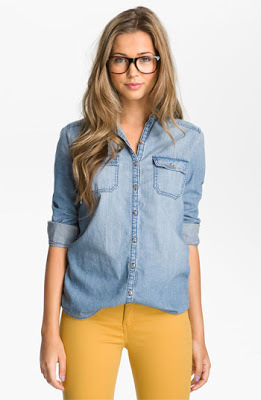 I love the denim shirt and the Nordstrom sale. I was just there yesterday buying some new shoes! 2. Mustard and mayo… Hilarious! 3. I CAN'T WAIT FOR YOUR BACHELORETTE RECAPS!!! I went to buy my shimera cami at Nordstroms today, and the salesperson said she couldn't figure out why they have had so many people coming in over the weekend asking for Shimera camis! Ha! I told her I knew exactly why! 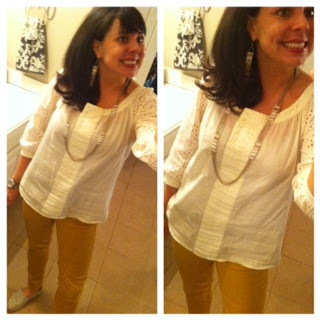 Seriously, Nordstroms should pay you….love my cami! I am so excited to hear you are doing a bachelorette recap! I always read your DWTS recap because they are so entertaining, even though I don't watch the show! 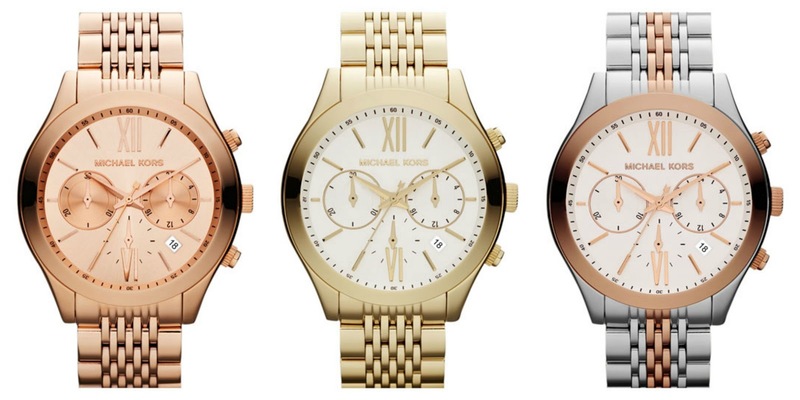 I so regret not picking up the gold MK watch! mustard and mayo. 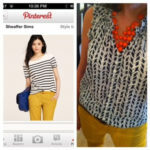 great for outfits and memorial weekend style! i think i like your outfit better than the pinterest one. I have to know….how long does it take you to write a post and do all your links? I mean you are a champ! 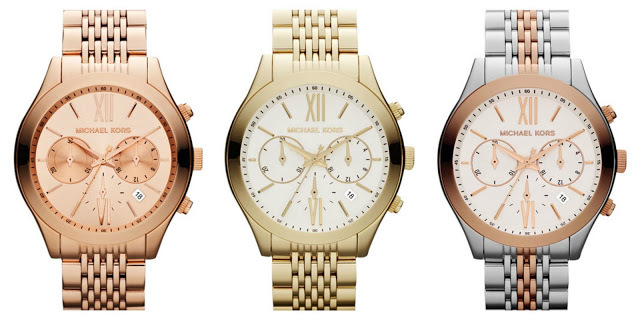 And I am sooooooo sad I missed out on the MK watches. They are gone now! 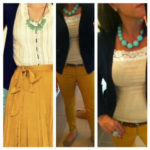 Love all the ways you styled chambray. I didn't even notice the doll until you pointed it out. Creepy!